My posts on Mark went silent on public media after May 11th 2018 and we struggled on until his death in St Peter’s and St James Hospice outside Lewes. During the year of his dying I’ve moved house 5 times. Twice in Seaford, then a ghastly, dark rental in Lewes, on to Wimbledon and back to our tiny Lewes house. Without him I am a nomad. My companion of 52 years has gone and I am left with energetic photos of his highly active life. Mark decided to pursue privately funded cancer treatment in London after his Sussex oncologist said she could do no more and we struggled on for an incredible six months. He suffered many blood transfusions, plenty of chemotherapy, one bout of toxic shock and took oodles of morphine. Although not enough to destroy the pain. His courage in enduring this disease was as outstanding as his enthusiasm for life. We agreed a family cremation with just myself, Annabel, Simon and Tamsin in attendance. It was Christmas time and the rest of the world was in joyous spirits. On January 6th, we had a small funeral for family and friends in St Michael’s Church in Lewes. Mark would have been proud of us all and the glory of a service on The Feast of Epiphany. Here is a piece I wrote for a competition. Weeks after Adrian’s death, when I wore the coat at the Royal Academy, a woman in the coffee queue admired its colours. ‘A A Gill told me it was from Uzbeckistan’ I boasted. How I longed to smuggle her away and force out stories of their fabulous meals together, but in the politeness of the dark, Academy’s Member’s room we parted, so much from his Pour Me book bursting for answers. On December 10th 2018, exactly two years after AA Gill, my husband Mark, died from the same ‘full English’ and I miss them both for their fierce passion for eating and their courage in challenging life to the limit. I looked down from my favourite seat on the 93 bus from Putney to Wimbledon – front seat left hand side, with its big window view of the world where I can peak into the giant front gardens on Wimbledon Common. An old man walks slowly along the pavement below me, head down, wearing an overlarge black anorak, it’s hood cloaking his head like a monk’s habit. A man that does not want to be seen, lost in his own thoughts. My husband. As I journeyed on the bus to fetch our shopping I realised these past weeks had been spent walking beside a dying man. A man who was once strong and upstanding, argumentative and opinionated. A man that supported me in all things and got things done. And now it is my turn to remember the keys to the house and cars. My turn to make sure the car is full of petrol with a valid MOT. My turn to check that we have the chemo pills and remember to drive us to hospital appointments. My turn to take out the rubbish and buy the toilet paper. We are never going on holiday together again, never to the theatre or an art gallery. Our travels from now on will be hospital and surgery visits, with short drives round the countryside for stops for cups of tea and toilet visits. Now we are on our most courageous journey together towards his death. He does not want to travel there and I do not wish to take him, but cancer gives us no choice. Like the men on death row, the hostage taken by Isis, the tortured in Iranian prisons, we must face our future. Like those people there is usually one end – death. How hard for the wives, mothers, and children of those men to face losing their lives. I wonder at their pain, and I cry at my own. Cancer is not a kind, fair way to end the life of a man that has always been kind and fair. What purpose is served in us suffering so? My husband and I walk together to his death. He does not make this journey on his own.’Rage, rage against the dying of the light.’ said Dylan Thomas of his dying father. Can I write something better for my crying husband who says he is not afraid to die, but finds the process unbearable. Can I find a way to shelter his suffering, to morphine out his memory and help us to cope? Our revels now are ended .. We are the stuff that dreams are made of and our little life is rounded with a sleep. Last weekend was back to the Wombles of Wimbledon, so I’m sorry but busy in London this meant no email. Our flat was in great shape after the refurbishment so thanks to Jenny and Annabel – interior designers as well as great cooks. It was good to walk on the Common and see Sue and Axel, Lesley and Fiona. Jenny was able to pop out and see more of her London friends. 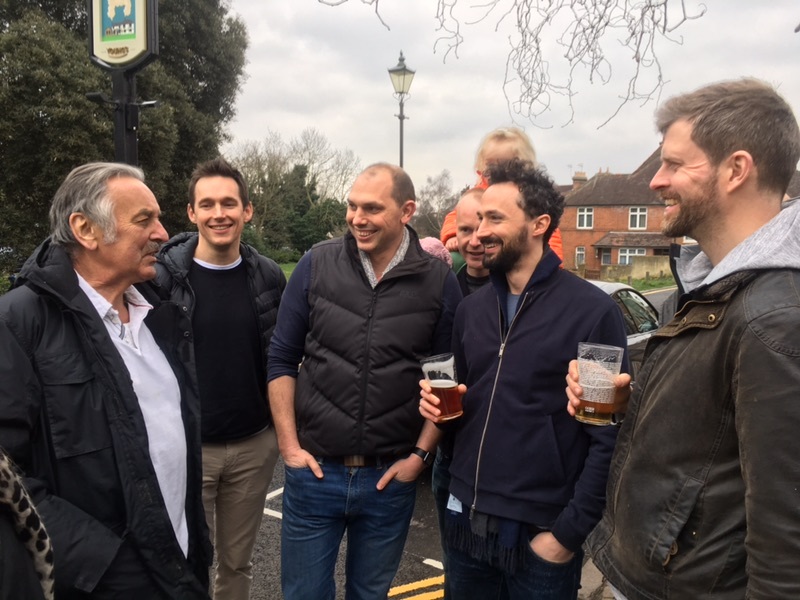 Simon got together so many of the young men who we were privileged to entertain at so many Sunday lunches during their school years at King’s Wimbledon. You can see the picture of the magnificent young men. Now we are back in Seaford and have met the oncologist with possible encouraging news. When we first met in early February she said I was dying. She now thinks there are signs that the cancer is being hit. But verdicts have to await next week’s blood test, which will hopefully allow me to receive a full chemo shot for the first time and then a CT or MRI scan to see the effects. I’ve stopped reading journalist Melanie Reid’s pages in the Sunday Times magazine – she was paralysed in a riding accident five years ago. And I’ve stopped listening to most of the news. Yesterday my challenge was to find humour during our visit to the oncologist. I’d spoken to an ‘O2 guru’ about my phone so who knows if funny things were out there to make me laugh. As you enter Eastbourne Hospital there’s a huge sign. So essentially ….. Off and go home. My humour did not stretch any further. And though I’ve never appreciated it so much before, all the kind words and memories I’ve received in recent weeks do show me just how much we are moulded and rewarded in life by our family and friends and it’s good to have decluttered the brain enough and to have opportunity to see just that. Perhaps that’s what A A Gill was doing when he called his cancer ‘ the full English’. By coincidence my favourite t shirt also depicts the full English breakfast. 16th March is the third day of Mark’s 2nd chemo treatment and he says he feels trapped. And so do I. We can’t leave and go away. We can’t dream of holidays for summertime, or plan European city breaks. We can’t imagine where our next house will be, or book theatre or art gallery visits. It feels like the lull before the storm. Like sitting on the upper deck of the Titanic and knowing the iceberg is approaching. Knowing that we are not going to get in the lifeboats or dive into the freezing Atlantic. I hope for once we’ve booked first class and are not locked in steerage with Leonardo DiCaprio. Mark starts with his favourite Manhattan cocktail – he’s told the barman how to mix it perfectly despite the tilt in the ship – or is it boat. And I’ve got a glass of the Titanic’s finest Moet champagne. The staff have run off and left us a dinner tray covered with a silver dome in the empty restaurant – Filet mignon for Mark and Lobster thermidor for me. Just sitting there while the band plays Nearer My God to Thee as we wait. Philip Carr Gomm on his last visit has said to focus on things that are bothering us to discover how they can diminish. Today my word is ‘powerless’ as it’s the weekend, when the medical world is shut, no-one is working – so don’t get ill.
There’s no point being frustrated by it, just accept and enjoy the day. Thankyou for the jokes, which I’ll put on the blog. I’m still puzzled how the Eastbourne Hospital oncology department has a zero record for people that don’t turn up for treatment – do they all survive each month? Sarah would listen to Mozart for Meditation and feast on her husband Simon’s chicken dinner with garlic, lemon and thyme. Simon, Sarah’s husband, would play Rachmaninoff Vespers Songs for Cherubin and look at the sky. Sue, my wonderful masseuse would go and sit by the sea and wait – whatever the weather. Mark wants to listen to Elvis singing His hand in mine, with our patio doors open and eat smoked salmon and sashimi with a glass of Rioja white wine. I want a helicopter to fly me to the derelict dockland area in Dieppe to Comptoir a Huitre where the chef has a plate of solette meuniere ready with some chilled white Gascony wine. Betsy would phone and email all her family and tell them she loves them. Giles, her husband, would listen to Starman. Hermione, Isobel and Gile’s daughter would like to dance to ‘I follow rivers’ and eat cake and be in the sun. Laurence Abalone, Scallops in Ginger and Moule Marinere washed down with Puligny Montrachet, whilst watching my daughter showjumping with the Bespermark mountains or the Med in the background here in Cyprus, depending where you gaze…. Weather Report by the Tennors. Esta Navidad by Jackie Washington. Yes it is by The Beatles. Food to eat also struck a chord, pun intended! Gravadlax, steak diane and creme brulee with poached rhubarb. Pork belly with crispy crackling, lashing of English mustard, creamy mash potatoes, cumin flavoured carrot matchsticks and cavolo nero followed by tarte tatin with creme fraiche. This is the second visit by Philip to our house by the sea, and this time, in brilliant sunshine. The first visit came in torrential rain and storms, just after Mark was diagnosed with an aggressive cancer and given weeks to live. Philip left us with great wisdom, which we turned into our ‘Ganesh moment’ where we sit quietly round our table and light our ‘kitsch’, turquoise elephant candle and wait for someone to speak about the moment, or sit in silence. Despite the raised emotions, we leave feeling very calm and Mark’s face relaxes and looks happy. We met Philip when he gave a talk at Villa Events in Lewes in 2011. Celebrate the seasons and pay attention to how the land and the plants change with the year. The magical landscape of Sussex has little known stone circles, ley lines, powerful alignments to historic monuments and ancient folklore. Philip, the chief druid, talked about his work and shared his knowledge on the stories and legends of the ancient sites of Sussex. We learnt about giants throwing stones at each other across the South Downs Way, and the eight ancient rituals to celebrate the seasons. Many of these are held on the Tump at Lewes, when a group gathers to pipe in the dawn and acknowledge the power of the earth. Today we widen the discussion. Mark shares that he is not afraid of death, just sad that he is leaving us all behind. He hopes that the tiny silver elephants that he has commissioned for us will give us strength and contact when he has gone. Philip talks about people visiting in dreams. By coincidence, my niece has just sent a text that she had a visit from my father in a dream, and that he came to reassure her, and she hopes he will come again. So I guess you never know. As Philip say, the world is all energy that swirls around. The elephant in the room today are the issues that surround us. I mention despair, and Philip suggests we spend time just thinking of it, and like pain, we may be surprised how a resolution is found. It’s called ‘paradoxical intention’ – I write notes on it – where ‘what you resist persists’. A concept developed by Dr Viktor Frankl. We need to focus on the tension or problem, not resist it, and discover how to let it go. The brain, Philip says, if tuned into the bigger picture. I just hope we both can learn this new skill. My mind clung to my wife’s image, imagining it with an uncanny acuteness. I heard her answering me, saw her smile, her frank and encouraging look. Real or not, her look was then more luminous than the sun which was beginning to rise. I saw the truth as it is set into song by so many poets, proclaimed as the final wisdom by so many thinkers. The truth – that love is the ultimate and the highest goal to which Man can aspire. I understood how a man who has nothing left in this world still may know bliss, be it only for a brief moment, in the contemplation of his beloved. In a position of utter desolation, when Man cannot express himself in positive action, when his only achievement may consist in enduring his sufferings in the right way – an honorable way – in such a position Man can, through loving contemplation of the image he carries of his beloved, achieve fulfillment. Viktor Frankl survived the war but his wife died in Bergen Belsen. What wise words I will take with me for today. After dinner last night Mark and I sat with his sister Janet and brother in law Bryan around the table and lit a large, turquoise elephant candle called Ganesh. A strange ritual for us. Mark says the candle reminds him of something he might have won as a child from the Southend fairgrounds. Bryan comments that the candle is the elephant in the room, an intruder that he was not keen to meet. Mark describes this visitor in his own words. ‘The sea has been calm for a week but today it is becoming turbulent as the snow storms approach. My thoughts turn to the disruption brought about by my intruder. It seems to be eating a lot, taking more than its share, so its disrupting my body and affecting the things we can do together. I’m now enjoying delicious food from Jenny, Annabel and Janet after a sensible talk by the hospital dietitian who says I can eat and drink anything I like. It’s a pity that the intruder seems to like my diet too. 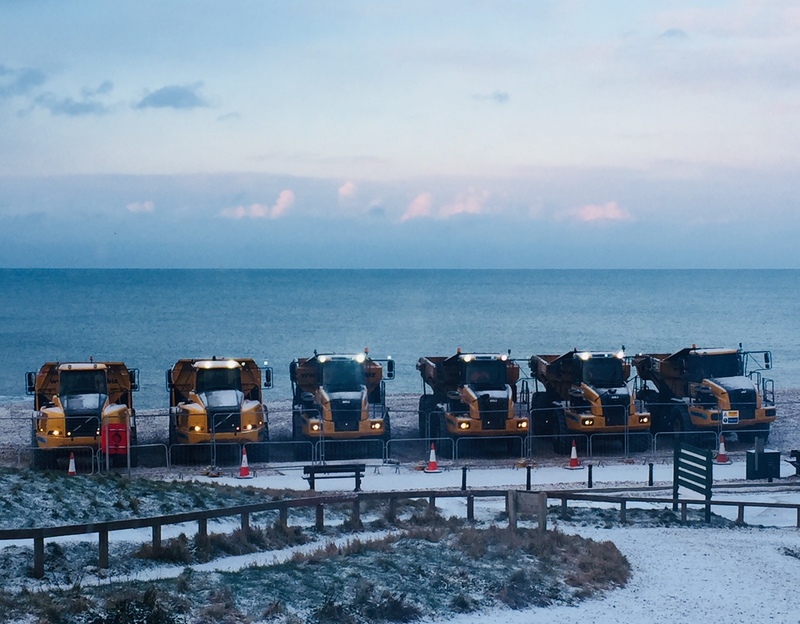 As we look out over the sea each morning, six yellow dump trucks begin their 10 hour shift, driving the shingle from the groyne at Splash Point and moving it westwards to Newhaven harbour. Men arrive early in Ovenden vans, wearing hard hats and dressed in orange workgear which reminds me of Guantanamo bay. ‘We’re here for five weeks, love – to stop your house from flooding.’ Climate change brings many storms to Seaford and in past years stones blew off the beach and smashed windows. Try opening a car door on Seaford seafront – there’s no preparation for that! Our terraced house on Cliff Close will no doubt shake and rattle, leading to sleepless nights. I’m thinking of renaming are block Cliff Getting Closer. The elephant ritual sounded such a brilliant combination of close friends, significance and laughs. Hey, who cares what it means if it made for a memorable evening …and anyway if Hannibal thought elephants would help him scale mountains and manage adversary then it sounds like a good plan ! Des Thank you for the emails. It’s good to hear how you are coping, it seems to bring us closer to you.